I would like to show you, how to make an on-board effects loop control (switch), as a part of your guitar wiring. It's something known by my from the Jerry Garcia's axe – Tiger. The loop control will allow you to switch on and off some effect pedals by the toggle in your guitar body. It will also give you a possibility to shape the tone in a very unique way. The loop switch is placed before the volume pot, so you will be able to use it to control the pedal chain output. It means a lot of new, cool tones. 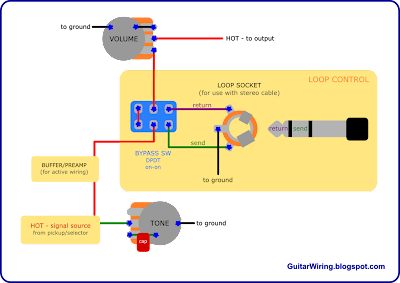 The diagram shows the loop control circuit and its place in the whole guitar wiring. The main parts of this project are: DPDT on-on mini toggle switch and stereo (TRS) jack socket. We need stereo jack connection to have the „send” and the „return” of the guitar effects loop in a one cable. It's a really comfortable way. This paths should go right to the on-board DPDT switch. This switch have two positions. The first one will omit the loop (bypass). The second one will connect it to the guitar wiring. All this system is placed before the volume control. It means, that the common guitar vol. pot can be used to shape the pedal chain output signal. It's a very cool thing. Maybe it will help you discover some new tones of your stomp-boxes. Basically, the on-board effects loop control can work in a passive guitar wiring - without a buffer. With a buffer, like in the Garcia's guitar, the output impedance will be much lower, so frequency response will be „clearer” - more transparent tone. This is how the on-board loop control is placed in the Jerry Garcia's guitar: Tiger schematic. You can also experiment with placing it after the all potentiometers as well. BTW, some time ago I made a wiring project based on Garcia's axe: Wiring Inspired by Jerry Garcia's Guitar. I didn't put there the on-board effects loop control, because I modified it to assembly in common guitar bodies. I was focused on the pickups, buffer, and the basic tone and volume controllers.